Leading off ‘Joint Effort’, James Brown’s ‘Think’ is pulled by the scruff of its neck and reworked as a massive funk rocker. Driven by a loud chopping guitar augmented by quirky brass honking, it’s a defiant statement that moves Humble Pie further away from the rock bands they were often associated. Pretty quickly, Marriott manages to tap into an unrestrained performance loaded with vocal quirks, much in the spirit of Brown himself. Clempson’s rhythm work, although never subtle, is so high in the mix you can’t help but be moved by his playing and Jerry Shirley’s drums are the work of a seasoned pro; a man who sounds as if he could drive this kind of groove forever, if so required. While each of the band members adds something essential to these four minutes, they’re all upstaged by guesting sax player Mel Collins – sometime of King Crimson – who fills the coda of the track with some perfect solo work, respectful to the early sixties greats whilst simultaneously adding his own style, leading to something more attuned to the mid-70s. Opening an album with a cover tune could be a mistake – almost like admitting a lack of faith in your own work’s abilities to have the same impact – but this is a real attention grabber. 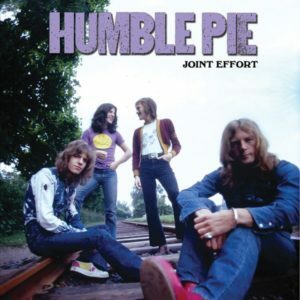 As far as Humble Pie’s covers are concerned, this is of one of their very best. It’s a perfect fit for the band – and they know it too, since the album closes with a reprise, much in the same way that Brown’s own lengthy jams were often split over two sides of a 7”. For the largely instrumental reprisal, Collins once again shows a mastery of his instrument, while Clempson has more room to impress with a few funky leads. Throughout, various vocal interjections play further tribute to the great JB, with Marriott even suggesting we “Get On The Good Foot”. Striking a perfect balance between completed studio recording and live in the studio jam, this is absolutely fantastic stuff. Sandwiched between the two halves of James Brown tribute are eight numbers of varying quality, but when the rest of ‘Joint Effort’ hits the mark, almost as much entertainment can be found. Keeping with the soulful vibes, the softer ‘This Old World’ fares brilliantly. Marriott quickly drops into a near perfect vocal, full of inflections that are inspired by Otis Redding, while the rest of the band sound like the most honed rock ‘n’ soul band ever. The combination of clean guitar rhythms and stabbed piano are a fine example of a crossover sound and a second deeper vocal certainly adds a further dimension. In comparison to something similar that might’ve been being tackled by Marriott’s old bandmates in the Faces (at this point reaching the tail end of their journey), this is far superior. Since no other studio recordings of this track have ever surfaced, it’s a great pity that the source material is marred by elements of tape drop-out, but even with the presence of technical faults, it remains one of the true highlights of these collected sessions. Part soul, part gospel and carrying slight overtones of blues, ‘Midnight of My Life’ harks back to Marriott’s time with Small Faces and very specifically their cover of Brenda Holloway’s ‘Every Little Bit Hurts’. With a strident piano channelling some fantastic sixties soul sounds used as a base, the rest of the band set to work, leading to a take that’s musically perfect with understated basslines and a drum part that almost swings. It’s Marriott who’s the real star, though, moving effortlessly throughout the piece, from quiet near-spoken passages, through aching soul cries and eventually peaking at a point where he pushes for volume. Although there are moments where he sounds as if his pipes might just burst, the rawness still cannot hide the passion and soul within his much celebrated voice. Coming across like a hybrid of a seventies rock band and funk street punks War, a grubby cover of Betty Wright’s ‘Let Me Be Your Lovemaker’ continues the Pie’s voyage further into soul. With a forceful bass and huge swathes of organ, this first recording of the number shows off a tune with major attitude. Allowing the guitars to take the back seat is a great move, thus providing Greg Ridley with more time in the spotlight. By the mid-point of the number, the groove that’s long been established feels as if it could go on forever…and sure enough, it never wavers from that original intent; the only concession to passing time comes from occasional blues guitar flourishes. Although not as arresting as the James Brown cover, it’s a good example of a band stretching far beyond their rock origins and proving to the world they could be equally adept at other styles. By the time this was re-recorded for the ‘Street Rats’ album the following year, the arrangement had unfortunately been shifted closer to stodgy blues rock. Despite featuring a chunky riff and peaking with a passionate solo from Clempson, the released version isn’t anywhere near as impressive as the version included here. Following some abortive studio chat, ‘Snakes & Ladders’ actually sounds like a demo, with the rhythms supplied by something akin to a click track, over which grubby guitars throw out a rough sounding riff. The addition of shakers and other percussion add to a borderline mess and its only a forthright dual vocal that comes close to sounding like a final take. Those vocals have a gruff presence, much like you’d experience from a great live show, but they’re just not enough to rescue what otherwise sounds like a cyclical, almost melody-free dirge. As the track fades, there’s a feeling that this idea just wasn’t ready to appear on an album, let alone pride of place opening its second side. Luckily, ‘Good Thing’ sets things firmly back on track with a companion piece to ‘Midnight of My Life’ with a full compliment of rolling piano and anchoring bass work. The blend of raw male voices and soulful female backing works nicely throughout, but the magic truly happens when Marriott reaches for the heavens, tapping into something that could easily be the work of his younger self. For the very briefest of moments, it’s possible to even think he’s about to revert to yelling his signature “Come on, children!”…and then the track fades. If ever there were a case of teasing the listener with a premature end, this is it. At just shy of two minutes, it too feels unfinished, but unlike ‘Snakes & Ladders’, at least it’s something you’d want to hear again…and again. Drifting through in a 70s haze, ‘A Minute of Your Time’ sounds like something that would have been a a major influence on works from Paul Weller’s ‘Wild Wood’ and ‘Stanley Road’, or on Steve Cradock when recording Ocean Colour Scene’s mighty ‘Mosley Shoals’. Indulging in some lounging and soulful sounds, in the main, it’s another great vehicle for piano and vocal that never rushes. It slowly sets the mood via a steady rhythm, eventually coming into it’s own with a blues fuelled piano break. When eventually moving into a passage where the soulful becomes the truly impassioned, the subtler aspects of Humble Pie’s wide array of talents really work for the best. Again, the source recording is a little rough, but in terms of historical importance, it’s absolutely priceless. Moving back towards a harder vibe, ‘Charlene’ cranks up the guitars for some groove-laden blues rock. With Clem and Steve’s guitars weaving in and out of each other from an early stage, the band quickly creates something great here, and with Marriot also delivering a slightly scratchy but effortless vocal, it’s closer to many Humble Pie recordings from 1970-72. A great example of the bluesy rock that carried the weight of their best known records, it’s a very welcome listen as part of this set, and especially so once a full compliment of female harmonies drifts in to hammer home the main hook for one last time. Even with some fantastic tracks to be found, the rawness of a couple of the performances means it’s sometimes possible to see why ‘Joint Effort’ got shelved and the band went back to the drawing board. While not the most consistent of albums, at it’s best it’s fantastic: the James Brown and Betty Wright covers, ‘This Ol’ World’ and ‘Midnight of My Life’ more than make it worth hearing. For the first time listener, it isn’t always recommended, however: as good as some of this might be, it definitely isn’t the place to start your Humble Pie journey… To experience this great band at their best, then 1970’s eponymous long player or 1972’s ‘Smokin’ should be chosen as a suitable jumping off point. This entry was posted in Album & EP Reviews and tagged 70s. lost album, clem clempson, humble pie, rock, steve marriott, vinyl by Real Gone. Bookmark the permalink. Why is there a photo of Peter Frampton on the cover? No idea. Ask the record company. They’ve decided this is the official artwork for their 2019 reissue. However, since it’s from Cleopatra, I suspect this has been done on the cheap and not necessarily with the band’s blessing, as per the previous CD issue on Burning Airlines Records back in 2004.